Is raising baby birds easy? Little Kiwi will find out in this humorous addition to the bestselling series by Bob Darroch.Little Kiwi doesn't like doing chores. Why should kids do all the work, while parents take it easy?But when a big storm blows through the forest, Little Kiwi finds himself in charge of some lost eggs. 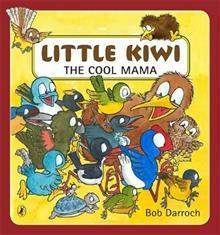 He is about to discover that a parent's work is much harder than he thought . . .And what's this funny little bird with a shield instead of feathers?Little Kiwi, the Cool Mama is an all new amusing story in the longstanding and bestselling Little Kiwi series by Bob Darroch.